The inestimable Maria Popova (@brainpicker) drew my attention to the very first car advert in a weekly publication, first printed in 1898, through a tweet, posted last week. It was printed in Scientific American. The headline jumped out at me: ‘Dispense With A Horse’. Seems like an odd way to sell a car, right? It is rare to see something presented in terms of what it’s not. However, this new Winton Motor Carriage is evidently not a horse; it is to replace a horse. In fact, it is arranged so as to replace the horse, the horse-drawn carriage, and the up-keep of the horse. One can be sure there are no horse related options with the Winton Motor Carriage. This is all true, and relevant to the decision making process. But it still ‘jars’. It seems – surprising saying it’s not a horse. Why does it seem so odd? Why does it seem so odd? Dan Ariely talked about these category boundaries in his talk at Authors@Google in 2008. His team went to a regular Toyota dealership and asked ”The true opportunity cost of buying a Toyota was not being considered.” visitors – prospective purchasers of a car – what they thought they would have to forfeit if they bought a Toyota. The team assumed people would have an answer for this question, but many were caught off-guard. Some said they were forfeiting a Honda for a Toyota. Many more were surprised – and a little shocked – saying they’d never really thought about it. The true opportunity cost of buying a Toyota was not being considered. This is quite common. 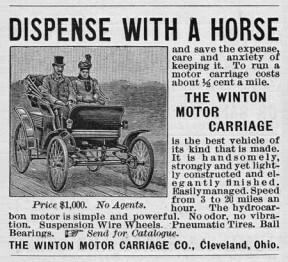 In this sense, the car advert from 1898 is correct in presenting the true opportunity cost of owning the Winston car versus a horse and carriage. But it’s clear we don’t naturally think that way. Why? Why do we rarely think outside of the category? An all-expenses weekend trip to Rome is played [rightcol]against an all-expenses weekend trip to Paris. They are different enough to present a challenging comparison. But with an additional ‘decoy choice’ of an all-expenses weekend trip to Paris excluding breakfasts, a closely related pair is created on the Paris side. The ability of differences to be more closely examined with related pairs is described by the cost-of-thinking approach.” . . . it is clear we prefer economy of thought.” It states that decisions between closely related pairs (Paris with/without breakfast) are preferred because they charge a much lower cognitive ‘cost’ to work out than decisions where pairs aren’t related (Paris/Rome). Indeed, one could easy switch Paris and Rome with the Winton hydro-carbon Motor Carriage, and a horse. Create a pair (dominant or related) with the Winton – another motor carriage with one inferior/superior function – and you make horse the outlying ‘Rome’. However so presented, it is clear we prefer economy of thought. Are there other reasons why do we rarely think outside of a category? We may also rarely think outside of a category because we are trying to minimize regret. In this case, ‘regret’ is defined as the ” . . . a choice from . . . the middle . . . insulate[s you] from maximum regret.”distance between the selection made from the choice available and the perfect choice (for you). An outlier (because it is a new category ‘on the block’), such as a motor carriage has lots of potential regret when the main action is in the ‘busy’ (and established) category of horse and carriage. If you make a choice from somewhere around the middle of the action you insulate yourself from maximum regret. It is easy to critique an old-time piece of work (mostly because we enjoy the knowledge accrued by those whom lived before us), but it can be more revealing than dealing in-the-moment because distal construal engages our calm, rational brain – the ‘noise’ of immediacy decreases. (Construal is evident in past as well as future constructs on the temporal plane). very interesting, i like it very much. Thanks and I visit again your site in future to see more.